The mouthpiece is the connection between musician and trumpet. It’s one of the most often-discussed topics among trumpet players, as it has a significant influence on sound, intonation, high notes, endurance, and precision–just to name a few. If the farmer can’t swim, he blames his swimming trunks. Similarly, the mouthpiece is often blamed for all kinds of problems. It’s the musician’s search for a certain “feeling” on the lips. If the feeling isn’t the way one believes it should be, the person reacts with tensions throughout the system, and air won’t flow freely anymore. That is the cause of noisy sound or even dual frequencies, the face turning red, the feeling that playing is exhausting, and on and on. A solid technique and playing daily is, of course, more significant than “little” details involving the mouthpiece. However, it doesn’t mean those details aren’t important, since it is, of course, easier to let the air flow if you feel well (and are comfortable with the mouthpiece). Besides, why make things harder than they are? Why not use the best tools available? Different mouthpieces have different characteristics, and it makes sense to choose the one that fits you best. You might have mouthpieces for different occasions. When you play in a jazz combo, you want a different sound than when you play in church. In an orchestra, the technical requirements are not the same as when you’re playing lead in a big band. So why not choose the mouthpiece best suited for the given conditions? It makes sense to use different mouthpieces for different requirements. On the football field, you have to put on shoes different from the ones you would wear at a dance hall. And, yes; there are some “all-around” mouthpieces available. For many years, my favorite has been the Vincent Bach 3C. 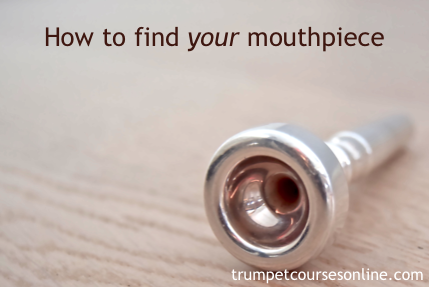 There’s a large choice of mouthpieces out there, so it’s easy to get lost. I know several people who went on a “mouthpiece-safari.” They’d choose a new mouthpiece, be excited because it sounded great and playing was easy. But then, after a few days or weeks, the excitement was gone, and they returned to their old mouthpieces. Am I trying to solve a problem by buying a new mouthpiece, or is smart and serious practice really what I need? Is a new mouthpiece absolutely the solution for me? Find a different sound (softer, warmer, sharper)? The cup: The smaller the diameter and the shallower the cup, the easier it is to play high, but the tone is shallow. Bigger and deeper cups provide a rich tone, but it’s harder to play high. Rim edges and width: A wider and smoother rim increases endurance, but causes loss of precision. A rim with a smaller width and sharper edge increases control, but decreases endurance. I’d like to know about your experiences with mouthpieces. Which are your favorites? For what occasions do you use them? Join the discussion; share your thoughts by writing them in the comment box below. Why did you pick the 1-1/4 for classical, orchestra, and solo? I like the sound. Sometimes I use Schilke 20.